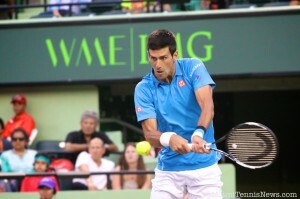 Novak Djokovic begins his Sony Open title defense on Friday night, March 22. Djokovic, the 2013 Australian Open champion, is looking for a place in the Sony Open record books by attempting to win three straight Miami titles. Possibly standing in Djokovic’s path is a potential semifinal encounter with Juan Martin Del Potro. If both players advance to the semis in Miami, it would be a rematch of last week’s 2013 BNP Paribas Open semifinal. In that match, Del Potro emerged the victor ending Djokovic’s 17 match winning streak. The only player to have won the Miami title three years in a row is Andre Agassi (2001 – 2003). 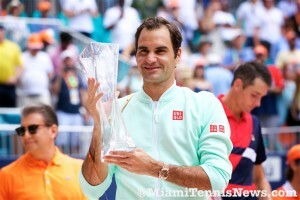 MIAMI, Fla. (www.sonyopentennis.com) – World No. 1 and two-time defending Sony Open champion Novak Djokovic will return to South Florida on Friday, March 22 (Session 8) at 7:30 p.m. to begin his quest to a three peat at this year’s 2013 Sony Open. Djokovic’s potential opponents will be determined when the men’s draw is announced on Monday, March 18. The three time Sony Open champion (’07,’11,‘12) is looking to continue his hot start to 2013 after capturing the Australian Open crown in January. Djokovic has consistently had great results at the Sony Open, reaching the finals four of the last six years, including an epic championship win over Andy Murray last year. Arguably the best player in the world the past two years, Djokovic has won 19 titles including 5 Grand Slams since the start of 2011 and is looking to hold a tighter grasp on the number one ranking. The Sony Open offers the ultimate entertainment experience over a span of two weeks with an array of events taking place in between exceptional matches featuring the best players on the planet. The exciting restaurants and lounges on site contribute to the electrifying buzz in which fans can enjoy and prepare for the launch of the evening session. 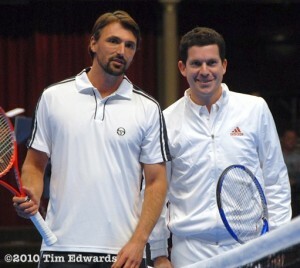 Also prior to Djokovic’s evening match, Fila will host “FILA Friday Night” on the entertainment stage at 6:00 p.m. This event brings some of the top ATP and WTA players to the stage in which fans can participate in a question and answer session. 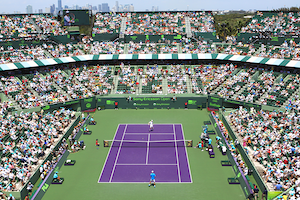 Tickets to the 2013 Sony Open are on sale now and can be purchased by phone (305-442-3367) or via the internet at www.sonyopentennis.com. A thrilling two weeks of tennis conclude with the women’s final on Saturday, March 30 and the men’s final on Sunday, March 31. ABOUT IMG: IMG Worldwide is a global sports, entertainment and media business, with nearly 3,000 employees operating in 30 countries around the globe. IMG’s areas of expertise are diverse and wide ranging: IMG College; IMG’s Joint Ventures in China, Brazil and India; IMG Media; IMG Events and Federations; IMG Fashion; IMG Models; IMG Art+Commerce; IMG Clients; IMG Academies; IMG Consulting and IMG Licensing. More information is available at www.imgworld.com.